When you hear the words "pyjama chic", I'm talking silky two pieces which look like luxe sleepwear, and loose trousers which could easily pass for pyjama bottoms. Although not brave enough to wear the former out, as for the latter, I'm all about that comfy trouser life. Having had a pair for years now, they are officially the comfiest things ever. I wear them around the house and on plane journeys they are are a GODSEND. I usually get raised eyebrows from people when I wear them; hey you lazy sod, too lazy to bother getting dressed today. But au contraire, ladies and gents. These are proper legit trousers. Up until now, I haven't felt very comfortable wearing them out for other events that don't include the airport or a quick dash for groceries, but the pjyama chic trend coming around makes me feel a little less timid to wear such a look out. Because of their loose shape, I like to wear something a little more fitted on top to balance out the look. I usually go for strapless bandeau tops, or a delicate camisole like the one featured above. This top I've had for years (a hand me down from my aunt!) and is one of my favourites. It has scallop detailing on it too - meaning I was all about the scallops right from a young age! And can we talk about the shoes? These were a recent gift from family who just came back from holiday and they are the comfiest things I have put on my feet in a very long time. How you do feel about the pyjama trend? 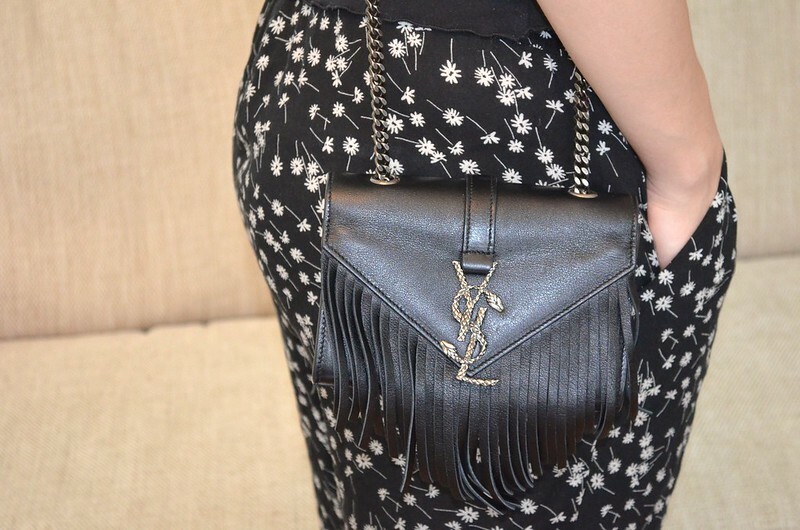 *A huge thanks to Farfetch for introducing me to the bag of my dreams!